William Pinchbeck's ranch near present-day Williams Lake, 1890s. BC Archives A-02405. The lush grasslands of the Okanagan, Cariboo and Chilcotin regions are ideal for cattle ranching. Early ranchers in British Columbia raised a few thousand cattle; herds have increased to about 265,000 animals. 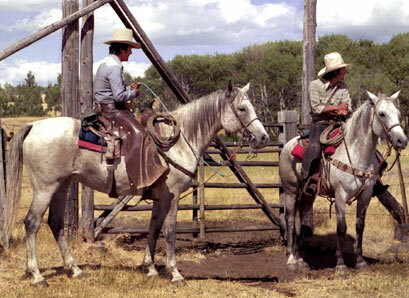 Cowboys of the Alkali Lake Ranch, 1979. BC Archives I-05193. 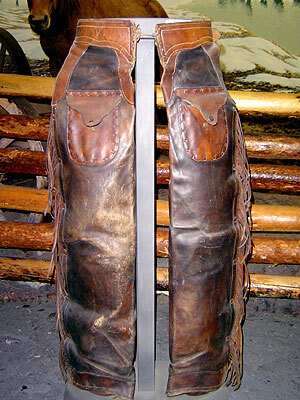 Chaps are worn to protect a rider's legs from brush. RBCM 967.356.1.